You’ve probably heard the saying, “Always use the right tool for the job.” That’s because using a wrench for the job of a hammer or a pocketknife for the job of a utility knife is ineffective and dangerous. Choosing the right tool for the job guarantees the best possible results, improving your productivity and reducing cost. The same goes for material handling equipment. It’s important to know if you are using the right system for your application, and if not, what you can do to change it. Each week, we receive dozens of inquiries about switching from multiple forklifts to one overhead crane to improve efficiency and reduce cost. Oftentimes, the application has simply outgrown its current system, and manufacturers are looking for something better. Forklifts can be effective for certain operations, but when your application requires a larger, more comprehensive material handling solution, forklifts can become more of a problem than a viable solution. Usually, manufacturers will use a forklift or even multiple forklifts to transport materials from one part of their facility to another. But, forklifts can only stack materials as high as the mast will elevate. Forklifts also require multiple workers to operate, and involve more product handling. All of these issues can result in an ineffective operation with more expenses and less control. If you are looking to streamline your production process—or considering a forklift-free application—an overhead crane system may be the perfect solution. Switching to overhead cranes reduces long-term costs and quickly results in a full return on investment. It’s true. Purchasing a new overhead crane system may seem like an expensive endeavor, but it will pay for itself almost immediately. 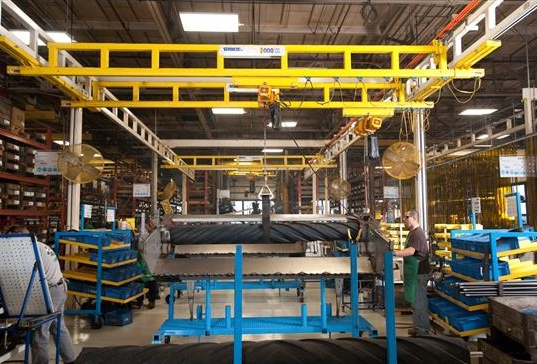 Overhead cranes are less likely to damage products or cause an accident in your facility. That’s because cranes require less product handling and minimize operator error. And, overhead cranes are easily customized for your operation, which means they’re specially designed to meet the needs of your application and overcome obstacles in your facility. Forklifts also require multiple workers for safe and effective operation, but overhead cranes enable one worker to move materials single-handedly. Frequent use of multiple forklifts will inevitably require regular maintenance and equipment service. Regular service creates unnecessary maintenance costs and results in having to staff multiple maintenance technicians. Furthermore, the downtime incurred from a broken material handling system will surely impact productivity. Even with maintenance, forklifts typically need to be replaced after several years. Cranes can last for decades, and purchasing a system with a good warranty guarantees the life of the product. 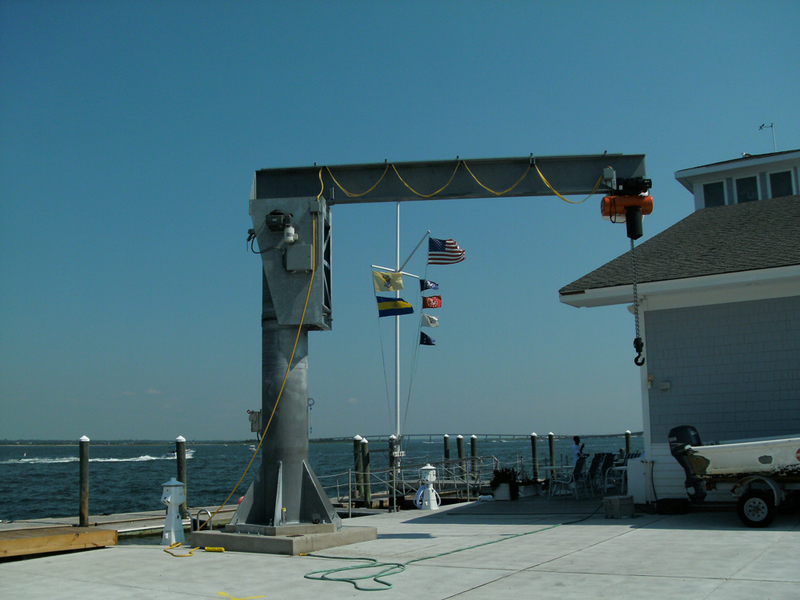 Furthermore, crane systems that are rated for Class C or Class D service are designed for frequent use and built to last. Replacing multiple forklifts with one overhead crane system will improve workflow and increase productivity. Using the right material handling equipment for your operation will streamline your manufacturing process and provide a leaner, more ergonomic system. Forklifts are limited in reach, movement, precision, and ease of use. 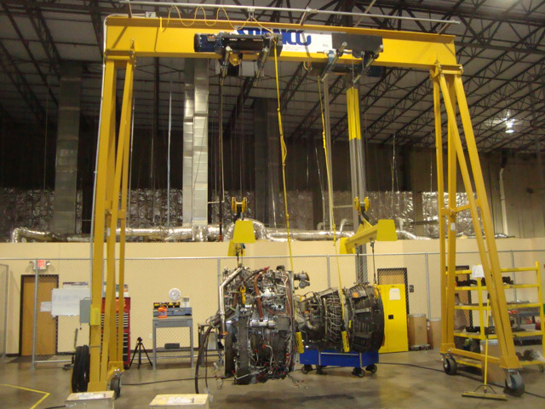 Overhead cranes allow for greater hook height and more efficient use of space. Choosing an overhead system that was designed for your facility will give you precise control over your entire assembly, individual workstations, and transportation of products and materials. While cranes are designed to provide systematic or complete facility coverage, forklifts can only transport materials within a limited space. Using a system that provides extensive coverage will directly increase the scope of your application and enable complete control of your facility. Overhead cranes allow for both forward and side-to-side movement, and they can be ceiling or track mounted for consistent applications that require manual or motorized travel over a fixed route. Systems that are ceiling or wall mounted also provide a more efficient use of floor space in your facility. For outdoor applications that require a material handling solution, forklifts are extremely limited. They’re designed for use on flat, even surfaces like pavement or concrete, which means they don’t work well in certain environments. Overhead cranes are much more flexible and, depending on the needs of your operation, can be installed permanently or assembled for portability. Gantry cranes, for example, offer greater lift capacity with more portability and control. Gantry cranes can operate on almost any surface, and overhead crane manufacturers like Spanco can easily outfit your system with wheels specifically designed for your work area. Overhead cranes are so versatile that they can help to streamline almost any manufacturing process, and with so many options available, they are easily customized to fit your operation. For example, manufacturers that are working with fragile materials or moving products that are easily broken can incorporate soft start features into their overhead system. Soft start features and multiple speed options enable complete control of materials without risk of breakage or product damage. The benefits of installing an overhead crane system to replace multiple forklifts are immediate and long lasting. There are many overhead crane systems that actually cost less to buy than forklifts, and with less cost to maintain and use, the investment alone is worth the switch. In addition to saving you money, using an overhead crane system will streamline your production process and drastically improve productivity. With four main types of overhead crane systems—bridge cranes, monorails, gantry cranes, and jib cranes—your options are endless. Each type of crane offers a different type of coverage, and each comes with its own set of features and benefits. Overhead cranes provide even more flexibility because they are fully customizable, allowing you to literally choose the perfect material handling system for your needs—at the right price. Most workers wouldn’t dream of using a wrench to hammer nails or a screwdriver to remove them. Why is it any different with your material handling equipment? If your manufacturing process is experiencing a lag in productivity—or if your operation needs a facelift—maybe it’s time to analyze your current system. One crane system with one operator can replace multiple forklifts, which usually results in a more effective use of space, fewer workers to lift and transport materials, less product damage or accidents in your facility, and far less system maintenance. Contact a local Spanco dealer to receive a detailed analysis of your facility, or call to speak with one of our technical sales experts for more information about how an overhead crane from Spanco can improve productivity and save you money.